The Leduc Foodbank's mascot, MT, high fives a young lady at the FCSS Community BBQ. It didn't look like the weather was going to cooperate that morning with rain coming down early in the day but as the old saying goes…if you don't like the weather in Alberta, wait five minutes. So by kick off time for the Third Annual FCSS Community BBQ at 11am the sun was shining down on Alexandra Park and the 'dogs were on the grill. At the normally packed event the weather did put a bit of a damper on attendance as not as many people came by to enjoy a free lunch in the park this year but the families that did show up had an opportunity to chat with many City representatives including Mayor Krischke and Councillors Smith, Finstad and MacKenzie, visit with friends and enjoy a lovely afternoon eating lunch al fresco. The City's Green Team had their Mobile Eco Station set up with various recycling receptacles on hand, the Classroom On Wheels bus was parked nearby and open for enjoyment, a bouncy house was seeing lots of use by the kids (and even an occasional adult!) and Leduc Victim Services volunteers took over the most important job of the day which was grilling all 500 of the hot dogs! This entirely free yearly event is made possible through a partnership by a number of agencies including FCSS, the City of Leduc, Leduc Regional Parent Link Centre, Leduc Public Library, Leduc-Strathcona Services for Children Family Day Homes, and Leduc and District Victim Services. There was no cost for anyone attending the BBQ but the Leduc Foodbank van was on site accepting donations, and by the end of the day several cardboard boxes were filled with edibles to help feed local families. In a unique twist the Foodbank had also set out two boxes filled with brand new containers of bug spray and sunscreen from which BBQ attendees were encouraged to help themselves free of charge. 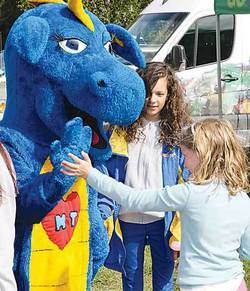 Of course the Foodbank's mascot MT was also on hand and a big hit with the kids who formed a continuous travelling crowd around the big blue dinosaur wherever he went. Leduc & District Victim Services were also handing out fun swag at the event with squishy foam stress balls (which, as demonstrated by one City Councillor could also be used for juggling!) and frisbees. Another huge hit with the younger set was Choo Choo the Clown who was kept busy the entire event building fantastic creations out of balloons for a seemingly endless lineup of children. Overall this event was once again a great success exemplifying regional partnership from many of our family service agencies and benefitting the residents of Leduc. It is through events like this that our sense of community is strengthened and these important organizations deserve a round of applause for all that they do to help make Leduc a fabulous place to live.